The amount of self-employed individuals in Spain never ceases to grow. Registering increasing rates year after year, the Spanish territory is, without any doubt, dominated by small firms. This fact takes us to understand that the related legislation is of huge relevance for us all. 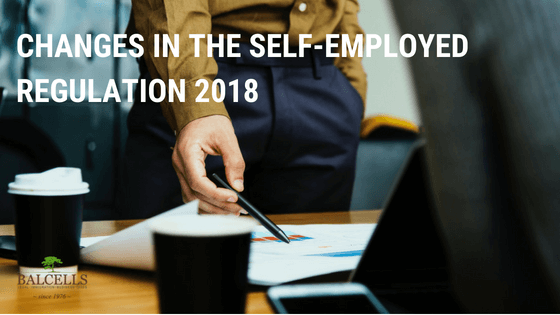 From the beginning of this year, few changes in the regulation have been implemented, and those will certainly have a big influence both for existing self-employed workers and to those still to join. Are you ready to discover which are the specific changes in Spanish self-employed regulation of 2018? The specific updates were introduced on the 1st of January 2018 by the Spanish government. The approved set of laws have been designed with the aim to make the lives of the self-employed much easier, apart from trying to attract a greater number of them to register. Those modifications have an incidence both in fiscal as well as in social security issues. Flat Rate. The previous flat rate is now enlarged to 12 months (versus the previous 6). The amount needed to pay by the self-employed during the first year is 50€. During the six following months, the bonification is equal to 50%, and for the following 6, a 30%. Work-life balance bonus. A few changes have been implemented in order to favour and improve the family conditions of the self-employed, such as child care, maternity leave (period in which the worker does not have to pay the flat rate), etc. Rejoining bonus. Those members who want to return to the workforce will find it much easier with the new legislation update of 2018. There will be some benefits when hiring relatives under certain conditions through the application of bonuses on the autonomous fee. For example, the law makes it much more simple now to hire sons and daughters with certain disabilities. Modifications pertaining to registration and cancellations. From now on, in order to compute the necessary social security payment, you will just take into account the number of days worked, not the entire month as happened previously in 2017. Tax deductions. Under certain conditions, utilities are now tax deductible. Those diets and overnights of which an invoice can be presented, which payment has been made online, and which have taken place outside of the current tax residence, are deductible within the IRPF. We should not forget that it is the legal framework that establishes the rules of the business game. Upon them, it will be the businessman the one in charge of developing its activity in a successful way, but always being strongly conditioned by that regulation. Like this, and through this measures, not only does the state favour and improves the “legal quality of work” for entrepreneurs but also erects an attracting strategy for new self-employed individuals. And, at the end of the day, it is them who push the economy forward. As a clear improvement respect to the previous year 2017, the changes in the Spanish self-employed regulation of 2018 go hand by hand with the self-employed boom that Spain registers during the last months, so much from a local origin as from foreign entrepreneurs. This apparent positive correlation can be a clear hint of how beneficial those measurements are. How do you think that the new update will affect the Spanish business sector? Leave us your opinion in the comment section! I have a Highly Skilled Worker residency as of now and I’ve lived for 2 yrs & 10 months in Spain (spent 5-6 months out of Spain during this period, in total) already. I would like to become an Autonomo worker. Of course, I have a NIE, social security number and a bank account. Would it be possible for me to modify my status directly with the Hacienda? Or do I need any additional steps? Thank you for your help & support. First of all, thank you very much for reaching out to us. Indeed, additional steps are required to embark in that procedure. That is why we suggest you to directly contact our lawyers (sending an email at info@balcellsgroup.com), so we can guide you step by step on how to do it, avoiding you all the legal hassle.